These days we expect most flight shoot em ups to be 3D with a first or third-person perspective. The more traditional top-down 2D format for the genre, which was once prevalent, seems to have been largely sidelined by most developers, except perhaps Art In Games that launched AirAttack. 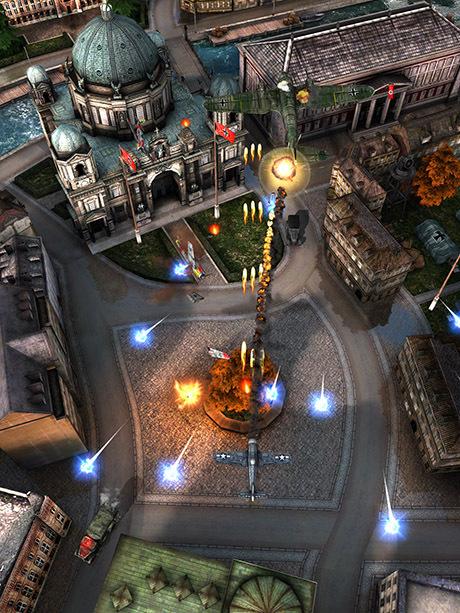 The original AirAttack had a top-down format mixed in with 3D effects, and the developer has just launched a sequel for that game this December. AirAttack 2 is the sequel to the original that is bigger and better. It is a shooting game set in the World War 2 era (1940s). Thus, in this game players are shooting down German planes, tanks and ships across expansive landscapes. The first game had 10 levels to play through, while AirAttack 2 has twice the number with 22 levels. In addition, it also includes five alternative planes to blast your way through the levels with. The planes have upgradeable arsenals. You can upgrade your planes with flamethrower, bombs, lasers (even though they have never really been invented for aircraft), homing rockets, wingmen and tail gunner. The most interesting upgrade is perhaps the tail gunner. When you switch to the tail gunner mode, the game becomes more of first-person shooter. With the tail gunner you can direct your fire with the gun’s targeting. So that should give the gameplay a little more variety. AirAttack 2 might be a 2D top-down shooter, but it is still modeled in 3D. The levels’ buildings and landscapes are not exactly flat, and occasionally the camera angles might rotate as in the video trailer above. The explosions and lighting effects add a little more graphical sparkle to AirAttack 2. And the game’s landscapes are fully destructable, meaning that you can blow up pretty much anything with your bombs. AirAttack 2 is now retailing at $1.99 at iTunes without any IAPs, and the game requires a hefty 334 megabytes of storage. You can add it to your phone or tablet from this page. Alternatively, check out the AirAttack 2 website for extra details.